In this video, we will discuss displaying all validation errors at one place using validation summary html helper. 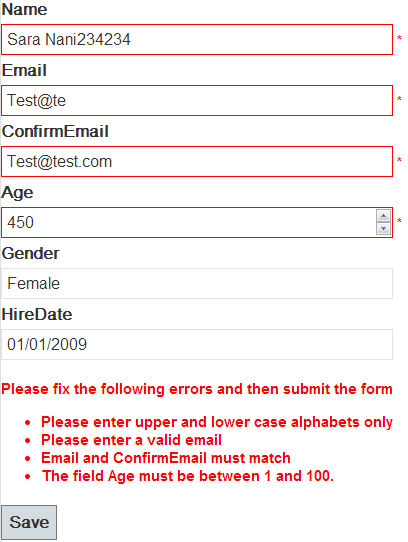 A red asterisk (start) should be displayed next to every field that has failed the validation. The output should be as shown below. We will be working with the example that we discussed in Part 85. Please watch Part 85, before proceeding. First of all, the validation error messages should be displayed in red color. On the "Edit" view, include a reference to Site.css style sheet. In site.css there are 3 CSS classes that control the display of validation error messages. Adjust the styles of these classes according to your needs. To display all errors at one place, use ValidationSummary() HTML helper. To display an asterisk, next to the field that has failed validation, modfiy ValidationMessageFor() html helper as shown below. At this point, next to the field that has failed the validation message, a star symbol will be displayed instead of the detailed error message. All the detailed error messages will be displayed using validation summary. I have a problem with "jquery.validate.unobtrusive.min.js" When I click at the Save button I get the message: "The field HireDate must be a date. I think it have something to do with Globilization and different dateformat's. How can I solve this problem?